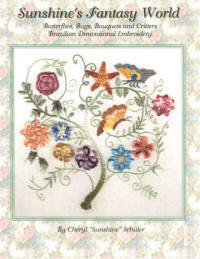 by Brandie Mikla Raised 3-Dimensional Embroidery DVD (Brazilian embroidery) Basic stitches and flowers are shown on this DVD of raised 3-dimensional embroidery. 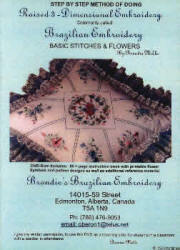 DVD includes 80+ page instruction book (down loadable from dvd) with printable flower symbols and pattern designs as well as additional reference material. DVD 500 $25.99 How Many? 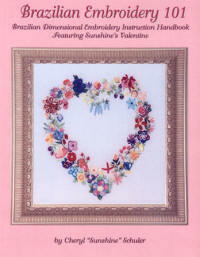 2 ½ hour DVD Anna teaches you the bullion, Cast-on, couching, Leaf, Buttonhole, Pistil Stitch, Lazy Daisy, Detached Buttonhole, Double Cast-On, French Knot and Straight Stitches. 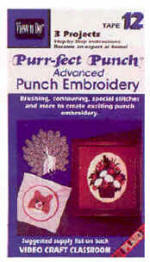 Linda Brohman - Purr-fect Punch. 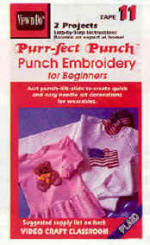 Punch Embroidery for Beginners video teaches two projects (teddy bear and American flag) with step-by-step directions for needle art decorations for wearables. Learn the basic punch-lift-slide technique with quick and easy results. 60 minute VHS video. Advanced Punch Embroidery video teaches brushing, contouring, special stitches and more to create exciting punch embroidery results. 3 projects. 43 minutes VHS video. 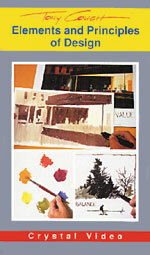 Tony Couch graphically explains how the elements of design, including line, shape, value, color, texture and direction, are used to build a design. He shows how each of the principles of design, balance, harmony, gradation, repetition, contrast, dominance and unity apply to each of the elements. 47 mins.